Each year the mullet swim from 'Ewa, past Waikiki around the end of O'ahu, as far as La'ie. Then they swim back. "Why do they do this?" people wondered, and told this story to explain. A young woman of 'Ewa had angered her family and had been sent away. She walked for many days, welcomed by strangers, yet longing for her home. At last she met a young farmer. Love grew between these two, they were married, and built a home at La'ie. There the young man made a fine taro patch, with sugar cane and bananas on its banks. He also had good sweet potatoes. With shellfish and seaweed from the reef his family were well fed, but they longed for fish. "The sea here at La'ie is empty," said the man, "and every day I think how good some fish would taste!" "Yes," his wife answered. "At my childhood home in 'Ewa there were fish in plenty. Why don't you go there and get some for us?" "Bring fish from 'Ewa!" the husband said. "Fresh fish would spoil! And a backload of dried fish would grow very heavy through many days of walking." "Bring fish in the sea," answered his wife. "Fish in the sea? I do not understand." "My father is a man of wisdom," the young woman said. "He has power from the gods. It may be my parents have forgotten their anger toward me and will welcome you. Then my father will offer you some gift. Ask him for fish. He will show you a well-filled store house and offer you salt fish. You must answer, 'I cannot carry such a heavy load. Give me fish in the sea.'" The husband stared at his wife, puzzled. She smiled quietly. "Do as I say," she told him. "Then you will understand." The young man trusted his wife and, though still puzzled, made the journey. It was a long, long journey following a trail beside the ocean. After many days he came to 'Ewa. The wife's family had forgotten their anger and were eager for news of their daughter. They welcomed the young man and when they found he was their son-in-law they wailed with joy. He told of his wife, of their good lands and food plants. "You two have prospered," said the father. "You have taro, potatoes, bananas, sugar cane. Is there anything you lack -- any gift I can give my dear daughter and her husband?" "We need fish," the young man answered. "Near La'ie there are none." "You shall have fish," the father told him and led him to the store house. "Here are salt fish," he said. "Half of them are yours." The young man remembered his wife's words. "How can I carry them so far?" he asked. "My back would break! Oh, give us fish in the sea." "If my gods are willing," the father promised and went to pray. The young man stayed in 'Ewa many days but nothing more was said about a gift. "I must return," he told the family. He was given a bundle of food for his journey, but nothing else. "Take our aloha to your wife," the parents said. Then, as the young man started, the father added, "You shall take fish in the sea." As he walked the young man repeated the words, "fish in the sea." Over and over he said them, but could not understand. He spent a night in Kou, at the mouth of the Nu'uanu Stream, and found men busy fishing. "There is a run of mullet," he was told. All the village feasted. "I wish we had such fish at La'ie," said the traveler. "Our sea is empty." Next day he paused at Waikiki. There too men were busy fishing. "There is a run of mullet," he was told. He journeyed on. At every stop he heard of fish and always envied the fishermen. "At La'ie the sea is empty," he repeated many times. At last he reached his home. His wife welcomed him gladly. He told her of her parents and of his journey. "Everywhere there were fish," he said. "Only here the sea is empty." His wife smiled wisely. Next morning she woke him at sunrise. "They have come!" she said. "The mullet." He hurried out. It was true! The bay was silver with mullet. "How strange!" he said. "The sea is no longer empty!" "These are the fish you brought," answered his wife. "My father prayed, and the gods sent the mullet to follow you." The young man hurried to join his neighbors in fishing. So that was it! At Kou, at Waikiki, everywhere along his journey men had caught fish because the mullet followed him! The young man thanked the gods. 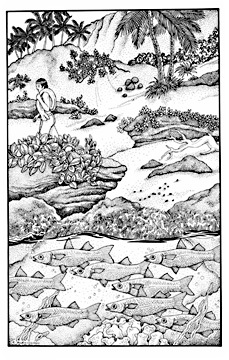 "Why the Mullet Swim Around O'ahu" is from "Tales of the Menehune (Revised Edition)," compiled by Mary Kawena Puku'i, retold by Caroline Curtis and illustrated by Robin Burningham. Published by Kamehameha Schools Press, &COPY1960 and 1985 by Kamehameha Schools. Reprinted by permission. "Hawaiian Folklore" is presented Mondays through the Star-Bulletin's Newspaper in Education program.